The latest iteration of the engagement highlighted the ongoing activity in this aspect of relations. This week, South Korea and Vietnam convened the latest iteration of their bilateral defense dialogue. The interaction once again spotlighted the growing security collaboration underway between Hanoi and Seoul as part of their wider strategic partnership in recent years. Security cooperation has generally factored into the broader relationship between Seoul and Hanoi, which was elevated to the level of a strategic partnership back in 2009. But there have been notable advances since South Korean President Moon Jae-in’s entry into office last year, which has seen a relatively greater focus on Southeast Asia under the New Southern Policy. That has continued into 2018 as well through various interactions. Indeed, this year has seen a number of significant developments in defense ties, including the inking of a joint vision statement in April and a new agreement between the two defense ministries that covered areas including logistics support for peacekeeping forces, natural disasters, and humanitarian relief. On December 10, the defense aspect of the relationship was in focus again with the convening of the Vietnam-ROK Defense Dialogue held at the deputy ministerial level. The Dialogue took place in Ho Chi Minh city and it was co-chaired by Vietnamese Deputy Defense Minister Nguyen Chi Vinh and his South Korean counterpart Suh Choo Suk. During the meeting, as is usually the case, both sides took stock of the state of bilateral defense relations in various areas as well as regional and global security issues of common interest. Beyond the Dialogue itself, the South Korean defense delegation also had other engagements during their time in Vietnam that spotlighted aspects of the defense relationship between the two countries, such as visiting Brigade 171 of Naval Region 2. According to Vietnam’s defense ministry, the two sides also agreed on some future steps to advance the defense relationship still further. 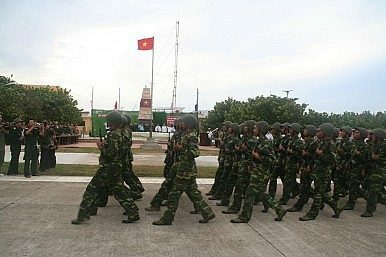 Focus areas included those such as defense industry, UN peacekeeping, and coordination at multilateral forums, an aspect that will be in particular focus as Vietnam prepares to assume the annually rotating chairmanship of the Association of Southeast Asian Nations (ASEAN) in 2020 after Thailand does so in 2019. Unsurprisingly, few additional details were provided publicly by both sides about their private deliberations or the status of previous areas of collaboration discussed, such as defense industry and human resource training. Yet the defense dialogue was yet another indicator of their growing security cooperation in recent years, and one can expect to see more developments in this front into 2019. What’s Next for South Korea-Vietnam Defense Logistics Cooperation? A closer look at an aspect of security collaboration between the two sides.